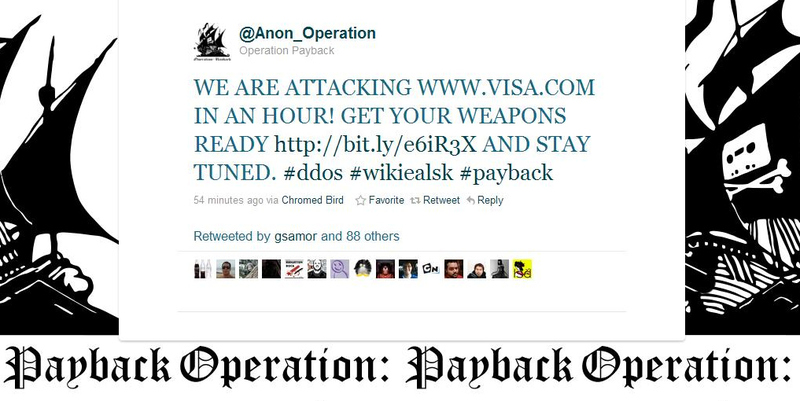 Earlier this morning, Anonymous’ Operation:Payback brought Mastercard’s website to a screeching halt for several hours. These attacks come after the arrest of Wikileaks’ Julian Assange and are being undertaken by an online activist group called Anonymous. The group has initiated something called Operation:Payback, a call to arms of sorts against sites that have removed services once accessible to Wikileaks. Before they brought down Mastercard.com with a large scale DDOS attack, the group had already targeted Swiss bank PostFinance as well as online payment giant, PayPal. PostFinance froze all payments to the website and PayPal canceled Wikileaks’ account, cutting off one of the major ways the website was able to acquire donations. If Anonymous follows through on its threat, it’s hard to imagine they won’t, it would take a few short minutes before Visa buckles under the huge torrent of unsolicited traffic that is sent its way. Update: Visa.com is now inaccessible. We imagine that whilst the external website is down, it will not stop the company from processing the millions of transactions it helps authenticate every day.